The more complicated world events in the dissatisfying present become, the more people yearn for immediacy and tend, in theoretical counter-plan, to flee the canon of the quotidian. This utopian locus amoenus has a name: Arcadia, the golden age sung since Theocritus and Virgil, an artificial ideal of creational harmony in carefree peace. The tragedy-based yearning for a happier world soon fed the worm of thought as to the transitoriness of all earthly things. At the beginning of the 17th century, the Italian painter Giovanni Francesco Guercino wrote "Et in Arcadia Ego" beneath a skull lying on the ground and in the painting by Nicolas Poussin referring to Virgil’s fifth Eclogue, this inscription is placed on a stone sarcophagus in the middle of an idyllic scene. Simon Beer's Et in Arcadia Ego contrasts the homeless bucolic of the here and now with an anarchic provocative counter-world. Beer’s peculiar dream-sleepwalk vision clearly bears traits of disjunction in its parody of a secret longing for primeval naïveté. Lured by the sound of twittering birds and tumbling water, the viewer glides through velvet hangings into the golden temple, now abbreviated to a momento mori sarcophagus, to nestle down in repose on the red carpet of its paradisal isolation. 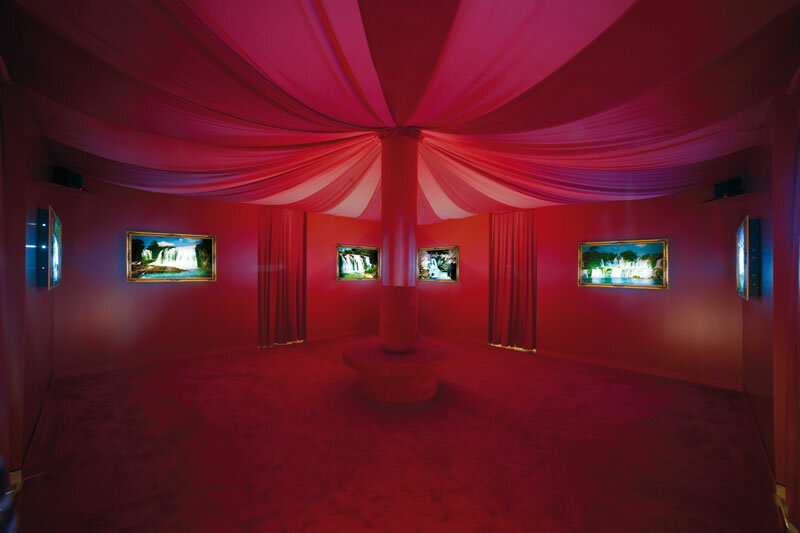 However, instead of the charming landscape of shepherds' idylls, in this chill-out lounge, the contemporary salutary quester experiences merely instant feng shui. 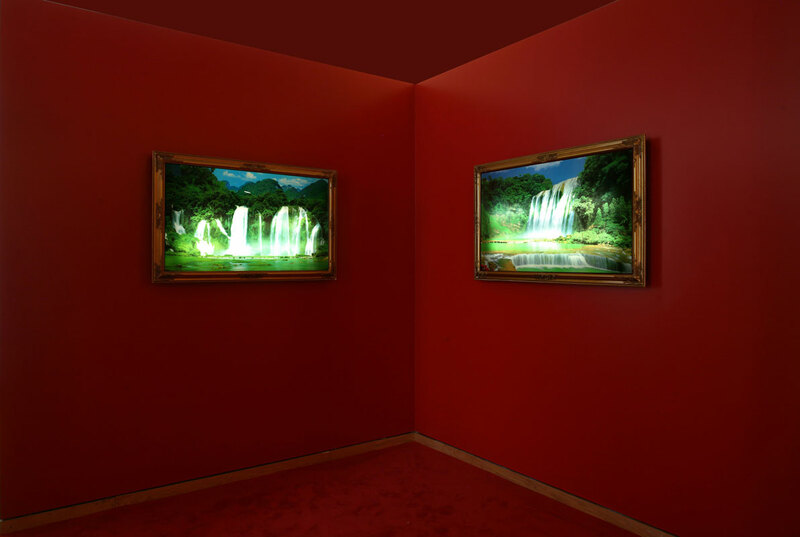 Framed in stucco-incrusted, gold-leaf drowned Baroque, electronically roller-driven light boxes bearing motifs of tropical waterfalls and the meditative murmurings of their canned sound produce a strange weightlessness. The artist elevates these souvenirs of a condition of satiated beatitude, objets trouvés made in China, from their existence as trivial quotidian objects to the grandeur of artworks. This gesture remains puzzling if the fact is not recognized that, for Beer, art's raison d'être is the sacralisation and perspicacious questioning of everyday life – true to the motto "Life is Art Enough," and to the communicative cooperation that is his most important strategy. Interior view: column with round seat, 4 entries/exits, velvet vault. Detail: 2 waterfall images, seen diagonally. Detail: waterfall image, 120 x 80 cm. 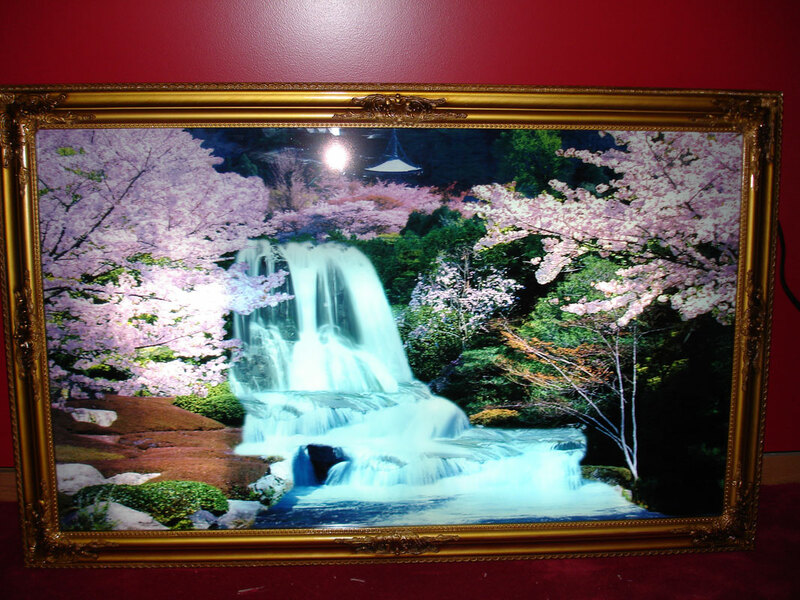 8 rotating waterfall images, each 120 x 80 cm. 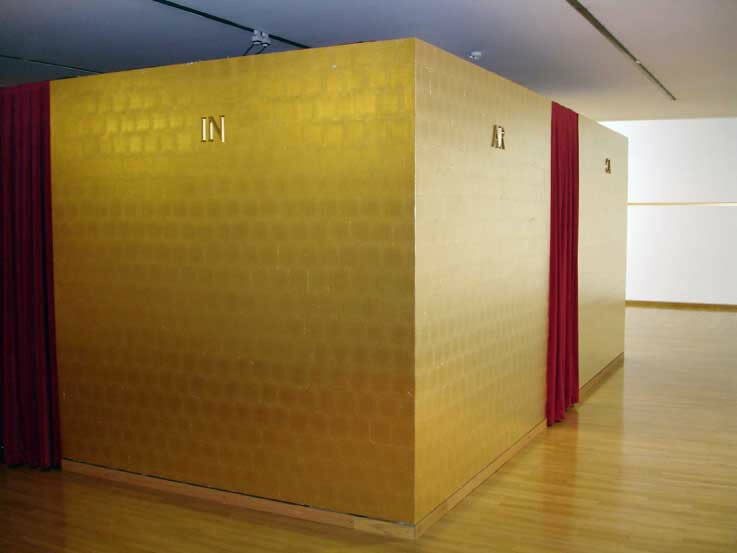 ; gold leaf; red carpet; velvet hangings; velvet curtains; sound system (chirping birds + waterfall noises); architecture: 8 x 8 meters, 4 meters in height; metal letters gilded (ET IN ARCADIA EGO).